Hey all you MAAG member artists. Have you noticed all the commotion going on around our new location? There’s new housing going up, new businesses opening, Holistic Health Fairs, and a whole new attitude. So we’re trying something new — a way to get more connected with our local community. We’re going to start up some summertime strolling, buying, eating, and all around appreciating the “South Side” of Mt. Airy! Little Jimmie’s and Malelani are going forces with us to make this an exciting kickoff. High Point is excited too. In fact, all the local businesses are “in,” and we are ready to turn out some art and bring it into the street. The event will be short, fun, and we think a sign of more robust “happenings” to come in the future. So join us, and get in on the ground floor. It’s a new experiment, one we think you’ll want to be part of, with very reasonable member-only exhibition fees. 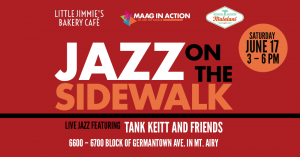 MAAG will host an outdoor and indoor exhibition during Jazz ON THE Sidewalk, and we invite MAAG members to participate in a Clothesline Outdoor Fine Art and Handcraft Show. Download your application here. 1. Hang your art work on the MAAG wall. Each artist may submit one piece of art no larger than 4’ x 4’. MAAG will take no commission on work sold, so all artists must be present 3 – 6 pm on June 17. Entry fee is $10. 2. Set up your own table in a maximum space of 4’ x 4’. Each artist/crafter must bring their own table, chairs, supports, etc. MAAG will take no commission on work sold, and participants must remain with their work during the event. Entry fee is $15. Love the idea? You can pay your exhibition fees right now if you choose. June 14: MAAG’s Submission form, JPG and Jury Fee are due. June 15: Submissions will be juried. We will notify you if your work has been accepted. June 17: 12 – 3 pm is delivery and setup, and 3 – 6 pm all artists must be present at the event.